The GitLab Build Status sensor monitors the status of the latest build on one specific branch. You can monitor your builds in either your own GitLab environment or on GitLab.com. We do not recommend to add this sensor for temporarily existing branches. This is not useful in most cases. The sensor uses the IP or DNS address of the parent device to find the GitLab server. To monitor branches in the GitLab cloud, enter gitlab.com as address in the parent device settings. 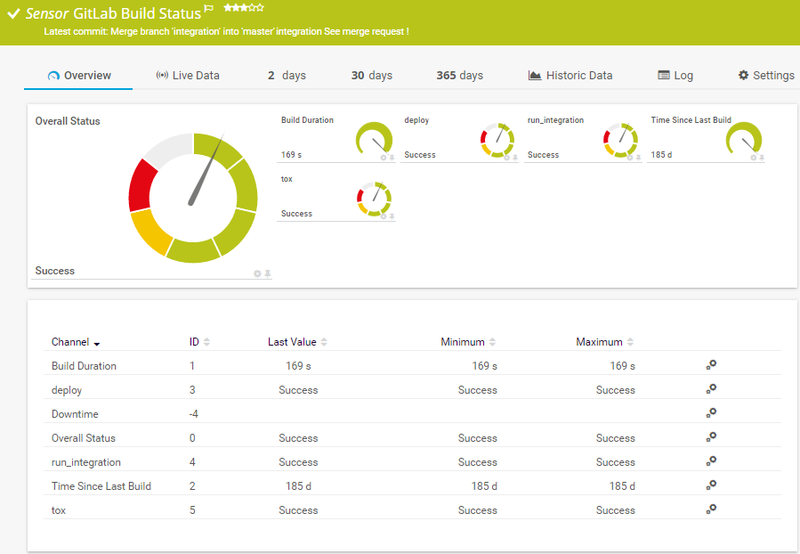 The sensor can only monitor builds that are using GitLab Continuous Integration (CI). Builds using external CI tools (for example, Jenkins) are not supported. This sensor type uses lookups to determine the status values of one or more sensor channels. This means that possible states are defined in a lookup file. You can change the behavior of a channel by editing the lookup file that this channel uses. For details, please see the manual section Define Lookups. The sensor requires an Access Token to access your projects on GitLab. Before you can actually create the sensor, it will ask you for this token. You can create it on the GitLab web interface in your profile under Profile Settings | Access Token. Copy the created token and paste it into the GitLab Access Token field in the GitLab Credentials dialog of the sensor. Select the branches you want to add a sensor for. You see a list with the names of all items which are available to monitor. Select the desired items by adding check marks in front of the respective lines. PRTG creates one sensor for each selection. You can also select and deselect all items by using the check box in the table head. Note: The sensor scans the last 100 builds of all projects during sensor creation (meta-scan). If you miss a branch in the overview, start a build on the branch that is missing and add the sensor anew. Enter the Access Token that you have defined in your GitLab profile. You can create the token on the GitLab web interface in your profile under Profile Settings | Access Token. By default, this field show the access token that you have provided during sensor creation. These fields show various information about the project and branch that this sensor monitors.